Skylarks has been a long time coming read for me. I heard countless good things about this novel before it’s release and it just kept getting more and more hyped as the days went on. I never read Countless, Karen’s debut novel, so i was excited to dive in to her second book and see what the fuss is about. 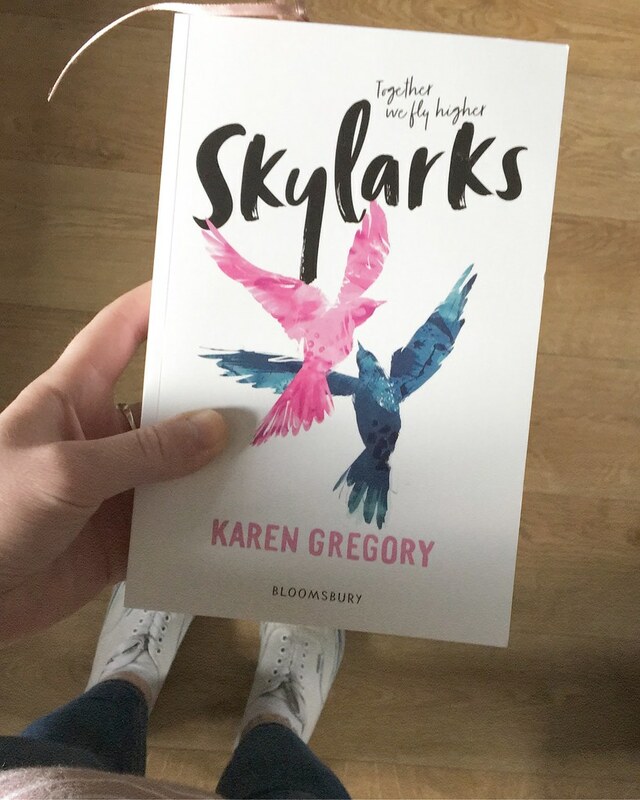 Myself and Sophie chose to read Skylarks for our June book club pick (mainly because it was also a YALC read) as so many people had hyped it. Skylarks follows Joni, a college girl who is struggling to make enough money to survive alongside her family. Her mother works every hour in the day and between her mother, Joni and her brother, they are trying to keep their life together. That is until the rent of their home goes up and they’re forced to campaign against it. In the midst of this Joni meets Annabel. One of the rich kids in her town and daughter of millionaires, Annabel doesn’t have to worry about money in any way. When their worlds collide more than friendship blossoms between them and they’re stuck trying to figure out how each other can fit into their lives. I wanted to adore this book, i really wanted to absolutely love it and rave about it with everyone else. That didn’t happen. The premise of it had me hooked, i really love a novel that accurately shows the less wealthy side to life in Britain and Skylarks definitely delivered on that aspect. The rest of it i’m not entirely sure on. First of all, i will talk about what i loved about this novel. The depiction of Joni and her family, struggling to afford basics and eating beans for dinner from a pan. Alongside Joni desperately working as much as possible in order to send her brother on a school trip, hit me hard. In no way have i ever experienced something like this in my life, and i’m grateful not to have done. But i know so many people that have, and living in a poverty stricken area it felt all a little too real. This is one of the strongest points of the story for me. Her family felt real and likable and Skylarks gave a great representation of what life is like for some families in Britain. If anything i’ve taken that away from this book. There were also some great community aspects regarding Joni and the people around her. The campaign to save their housing estate was wonderfully written and i enjoyed reading about something that felt very current. Then there was Annabel, not only did i find her story unbelievable, i also didn’t connect with her as a character. It had the whole ‘rich is evil’ vibe, which i very much did not appreciate. The story would have benefited so much more from having Annabel and Joni just figuring out how to swim in the same pool without Annabel showing off her money at any point and her parents being so rich they didn’t care for their child. For me that was not an accurate depiction of money, and i would have loved some humanity from her family. Admittedly, i also struggled to connect with Joni. I found her very whiny and childish, especially for someone of college age. At any sign of trouble between her an Annabel she tended to get annoyed very quickly and run away from the situation. That is one of my pet peeves in a book. I really struggled to empathise with her character regarding her relationship with Annabel at all. The thing i struggled with most was the lack of build in their relationship. As it starts to become obvious that they are in fact more than friends, it’s a frustrating read because i cannot imagine this relationship at all. Admittedly, it’s written to show ‘not all rich people are evil’ by Annabel actually giving Joni the time of day, but similarly they’re a match that just would not work in the real world. It’s clear they’ve been thrown together in this situation and they’re only seeing each other because they’re the only characters available. Neither of them have many interests that are talked about, nor do we ever see them having a general conversation about their likes and dislikes. There’s no build up to the relationship for me, and the representation of LGBTQ+ was poor. Again, i wanted to absolutely adore this book. I was ready to sit down and devour it, and admittedly there were bits that i enjoyed. However there was so much that i didn’t appreciate about the representation i just couldn’t enjoy it. If you want to come and talk to us about it, we’re meeting in Chapter One Books – Manchester at 7pm on July 12th. I’d love to hear other opinions about this book!